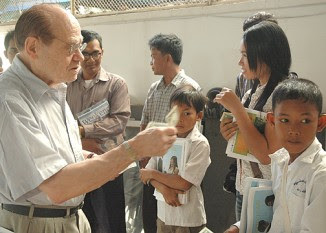 Bernie Krisher takes a hands-on approach to philanthropy with a Cambodian child outside the Intercontinental Hotel in Phnom Penh. PHNOM PENH, Cambodia (JTA) -- Headquartered in an upper-floor lounge of the Intercontinental Hotel here, which he has turned into his command center, Bernie Krisher irons out the details of his latest charity projects for this nation’s poorest children. Things, however,aren’t proceeding smoothly. An assistant tells him of foot dragging by intractable local bureaucrats over building permits for a new school. Krisher will have none of it. Krisher doesn’t have to call. He is called and invited to the palace. There Krisher is the guest of honor at a luncheon by King-Father Norodom Sihanouk, an old friend. Before massed ranks of court photographers and camera crews for Cambodian television, the diminutive elderly monarch thanks Krisher for his "precious friendship with Cambodia" and his myriad altruistic projects for the land's neediest. Sihanouk then decorates the American Jew with Cambodia's highest honor -- the medal of Grand Officier de l’Ordre royal du Cambodge. The new school is built on schedule. A half-hour drive from Phnom Penh, the Bright Future Kids' home boasts airy classrooms and a dormitory. It sits next door to another project initiated by Krisher: an orphanage for youngsters whose parents have died in the country’s raging HIV/AIDS epidemic. The Bright Future Kids program includes gifted but underprivileged secondary students from the remote provinces. In addition to their studies in Cambodia’s national curriculum, the two dozen participants also learn English and computer skills. During the Khmer Rouge's reign of terror between 1975 and 1979, as many as two million people died on Cambodia’s “killing fields.” Intellectuals, including teachers and doctors, were systematically eliminated, blighting the country's prospects for generations to come. Three decades later, Cambodia remains one of Asia’s poorest lands, where most citizens survive by subsistence farming, grueling manual labor or employment in sweatshops. The 16-year-old at Krisher’s Bright Future Kids home comes from the Rattanakiri province in the mountainous hill-tribe region of the remote northeast, near the Laotian border. The literacy rate there is only about 25 percent. Her parents scrape the hard earth for a living; Nhou is the only one of their six children to attend school. Nhou began her studies at one of several schools built locally by Krisher in his “Put a Roof Over Their Head” initiative. He conceived the project nearly a decade ago during a visit to the provinces, where he saw children learning in groups. The older children taught the younger ones in the open under the shelter of banyan trees. Krisher, a former Southeast Asia correspondent for Newsweek who publishes The Cambodia Daily -- he's a trailblazer in the country for freedom of the press -- has since helped build some 400 schools across the land. The schools cost $25,000 each to build and are underwritten by individual donors from Japan to the United States. Many even have Internet connection thanks to the “Motoman” system that links villages through a network of satellites and mobile units transported on motorcycles. Helped by a program with the Harvard Medical School, sick villagers living in far-flung communities with no access to health care can also benefit from modern diagnostic techniques and consultation with expert health professionals via satellite. In bamboo and thatch hamlets without running water or electricity, more and more of Krisher's proteges can join the global village with donated computers powered by solar panels. Enthused by her opportunity to study, Nhou explains in her halting, newly learned English that she read late into the night after long days working in the fields with her family by the light of homemade resin candles. Though suffering from a heart condition, Krisher says he won’t be slowing down. “My head is bubbling with ideas,” he says. One is to enlist Israeli agronomists to help teach poor Cambodian farmers modern farming and water management techniques. And there are plenty more schools yet to build.